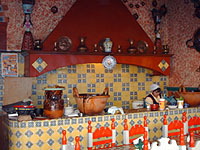 Diana Kennedy, the famous cookbook author and television chef, adds a third, less plausible version in her book The Cuisines of Mexico, [Harper & Row:New York] 1972, (p.199-200), “This time it was Fray Pascual who was preparing the banquet at the convent where he (the archbishop) was going to eat. Turkeys were cooking in cazuelas on the fire; as Fray Pascual, scolding his assistants for their untidiness, gathered up al the spices they had been using, and putting them together on a tray, a sudden gust of wind swept across the kitchen and they spilled over the cazuelas.” Thus mixing together such an unheard-of combination of ingredients. What do the real experts say? “The idea of using chocolate as a flavoring in cooked food would have been horrifying to the Aztecs—just as Christians could not conceive of using communion wine to make, say, coq au vin. In all the pages of Sahagun that deal with Aztec cuisine and with chocolate, there is not a hint that it ever entered into an Aztec dish. Yet, today many food writers and gourmets consider one particular dish, the famous pavo in mole poblano, which contains chocolate, to represent the pinnacle of the Mexican cooking tradition. …the place of origin of the dish and its sauce, the Colonial Puebla de los Angeles; this beautiful city, unlike others in central Mexico, has no Aztec foundations – and neither does the dish, regardless of what food writers may say.” Taken from The True History of Chocolate, Sophie D. Coe and Michael D. Coe [Thames and Hudson: London] 1996 (p. 216-7). There is no greater expert on pre-hispanic Mesoamerica than Michael Coe and this detective is convinced. Case closed (for now) on the mystery of the origins of mole poblano. No story about mole poblano would be complete without talking a little bit about the other moles. There is a lot of misinformation about mole out there, in general. Most culinary experts agree, there are 6 moles and as Susana Trilling describes in her book, My Search for the Seventh Mole: A story with Recipes from Oaxaca, Mexico, [self-published, 1997], she is looking for that elusive seventh mole. Does she find it? You’ll have to read the book to find out, and the recipes are fantastic, so you can try your own mole at home, if you dare. All moles are very time consuming, labor intensive and require many ingredients. Some sources state that some moles have as many as 100 ingredients, but that’s an exaggeration. But 30 ingredients is not unheard of, and some mole recipes contain 10 different varieties of chiles alone. Other ingredients include: peanuts, almonds, fried bread, plantains, lard, sugar, bittersweet chocolate, cinnamon, cloves and many more. For those willing to give it a try, here is a less elaborate recipe for Mole Poblano with chicken. Each Mexican woman has her own mole recipe, probably passed down from her mother. Because mole takes so much time to prepare, it is usually made in huge batches, too large for the home blender to handle. Therefore, women take their mole ingredients, all cooked and ready to blend, to large “molinos” or grinders in their neighborhood. The mole is passed through the grinders and comes out smoother than you could get from your home blender. It is not unusual to see women walking home from the molinos with buckets of mole for a fiesta. And be sure to have plenty of napkins nearby when eating any mole. As you dip your warm, homemade tortilla into the wonderful sauce, you are bound to take some home with you on your shirt, your arms and under your fingernails. Now you know you’re enjoying mole! For those who want to further delve into Mexican cuisine, here is a collection of our favorite traditional Mexican recipes . Also useful is our glossary of Mexican food terms and list of regional specialties.